I claim no expertise in miso soup. What did I miss? What should it have looked like, tasted like? How should it have been cooked? What should I have/ could I have added? Is it "scratch cooking"? or not?? Help, please!! My own BIG LESSON: This confusion, these questions, the uncertainty, THIS is what it's like to cook when you don't understand the language, the tools, the ingredients, the techniques, the outcome. And even aftering reading up a bit, it all still seems well, like Greek, er, I mean Japanese. And while it's likely I preach to the members of my own choir here (who reads food blogs except other cooks? ), it's a good lesson for those who consider ourselves evangelists of home cooking. Do we "dumb down" the kitchen code language, the searing, the sauteeing, the simmering, the scalding? There are good discussions about this happening at Simply Recipes and Tigers & Strawberries and The Accidental Hedonist. SO THE MISO SOUP, ALANNA, WHAT ABOUT THE SOUP? ... The broth was delicious, soft and subtle and comforting, a less salty, less strident chicken broth. I'm told that the broth is flavored by the kelp and bonito flakes but that miso, added near the end, is that bit of lagniappe that makes miso soup, well, miso soup. NUTRITION NOTES ... There're hardly any calories here and yet lots of volume. It made for a great light supper after a few days of too-much-too-rich food. But it didn't last: I reached for the peanut butter before bed. FROM THE ARCHIVES ... The Recipe Box features a whole section of New to Me vegetables. Perhaps, new to you, too? "What I did" and not necessarily how it "should be done"
Rinse the kelp in running water, then soak it for 5 minutes in cold water. Rinse it again and place in a saucepan with the water, bring just to a boil. (If you're going to eat it, you might want to chop it before adding to the saucepan.) Stir in the bonito flakes. Add the shirataki and return to a boil. Stir in the miso, stirring until it melts, keeping soup hot but not boiling. Serve -- and wonder what in heavens you just ate. I made my first miso soup last week and it really wasn't quite right. It was OK but didn't taste like the delicious miso soups I've had in restaurants. This seemingly simple soup is a refined art. 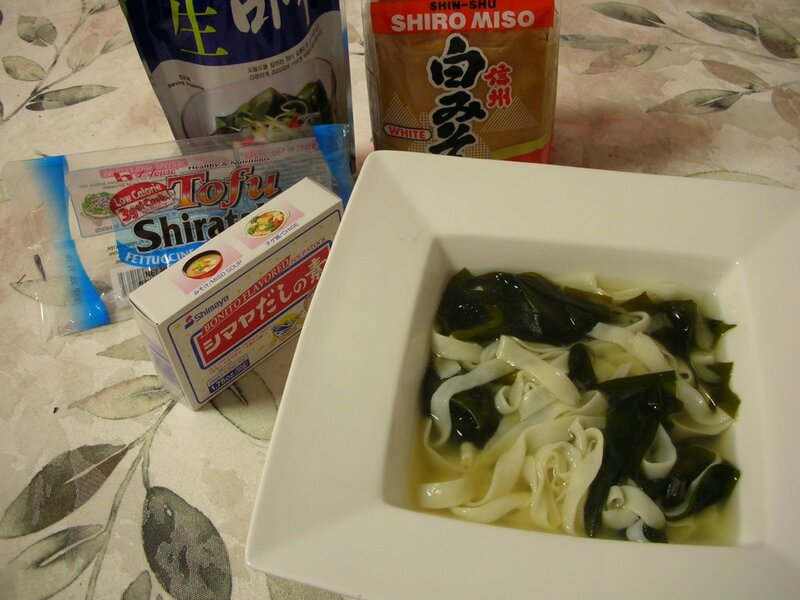 For the seaweed, I used dried wakame which you soak in water before adding and its definitely edible. The soup was OK flavor-wise but I used way too much wakame and then added spinach and the soup was too slippery in general. I used brown miso - there's a lot of choices (and qualities I imagine). Maybe I should actually follow a recipe for this next time! I bought miso paste yesterday when I was shopping sushi rice for maki rolls. I haven't made miso soup in years, but thought it'd be nice to have some paste in the fridge just for those nights you want a little something, but preferably without calories. Well, didn't have to wait long... Today I made a batch, but the damn paste package didn't have anything in a language I could read. A quick googling gave the rough recipe: 1 cup water for each 1 tbsp miso paste. Fair enough. Since I didn't have tofu or seaweed, I spiced the soup with some yellow onion and a handful of crushed, dried mushrooms I picked last fall. Perhaps not very authentic Japanese recipe, but I think it was pretty good. I used dark miso paste unlike the light kind often seen in Japanese restaurants. Just a note--miso is pronounced with a regular "s", not anything resembling a "z". Also, perhaps Catherine bought the kind of miso without hondashi in it, which is essentially like buying food without salt in it. Add some hondashi and it should taste just like what you get in the restaurants.